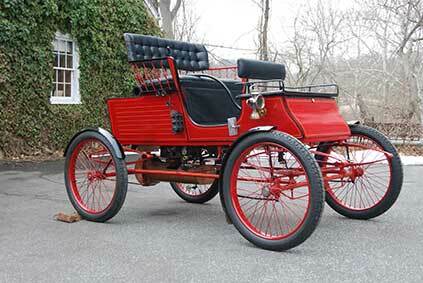 This 1902 Stanley Stick-Seat Runabout is one of the few remaining 70-inch-wheelbase Stanley steam cars. One of the oldest Stanleys in existence, it was purchased in 1944 from John Weibley, an antiques dealer in Harrisburg, Pennsylvania. The wheels were replaced with Ford Model-T rims, and the spokes were obtained from Wheel Repairs of New England and assembled by C & C Cyclery Shop of Kennett Square, Pennsylvania. This vehicle has been driven fewer than 200 miles since its acquisition by Clarence Marshall in 1944.